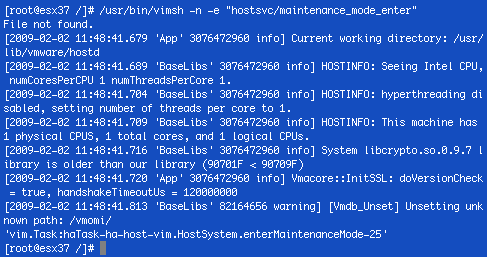 For those of you familiar with vimsh and used it to configure a scripted install of ESX 3.5, have you noticed that the following error would occur when launching commands using /usr/bin/vimsh ? The two commands are detailed in the Xtravirt whitepapers, vimsh and vimsh for ESX 3.5. I would recommend at least having a quick browse to see what can be achieved with these commands. Using vmware-vim-cmd in conjunction with esxcfg- can achieve some very interesting results, especially if you love to create the perfect KickStart build script. If only it is possible to launch vmware-vim-cmd commands using the RCLI just as esxcfg- can be launched using vicfg-. Anyone have an idea? And how about setting vSwitch1 to use Route Based on IP Hash? Q1. From what I gather the hostsvc/net/refresh will display the "Refresh Network Information" message under the Recent Tasks pane on VI Client directly connected to the ESX host. The internalsvc/refresh_network will NOT.I can only assume that hostsvc/net/refresh will do the job and is recommended because it is exactly the same as using VI Client to click on "Refresh" under Hardware/Networking/.Both lines are from Duncan's blog at yellowbricks, I've posted a comment there for clarification.Q2. They are supported on active/active configs, but the reasoning behind forcing the SC and VK portgroups to use a particular network interface is that "Route based on IP hash" policy will use the source IP and the destination IP to select the uplink network interface. Because vSwitch0 will only route traffic for the SC and VK (each being a unique IP address), you will find that most of the time all traffic will traverse the single network interface, leaving the other underutilised. "Route based on IP hash" is best used for the virtual machine networks, where you will have multiple virtual machines, hence multiple IP addresses.Both configs require static LACP 802.3ad enabled channels on the Cisco 3120s.I'll create a post detailing the designs that I use for vSwitch0 with SC & VK VLAN tagging.